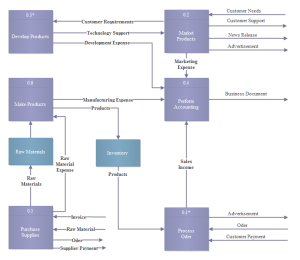 Creating database model diagram with free templates and examples. Database model diagram has never been easier. 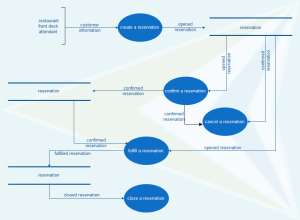 Data modeling diagram (DMD) portrays files and their relationship to each other in a comprehensive and logical format. DMD allows you to modify an entity's definition and to define the relationships between entities. Edraw database Model Diagram Software is a very easy-to-use and intuitive database design tool and database model Diagram tool which can save you hundreds hours of work. Edraw DMD software helps you describe processes, interfaces, data stores, and data flows and visually organize your project's FD files and define their relations. 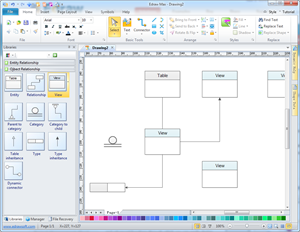 With Edraw's Database Model Diagram template, anyone can quick and easily create a Database Model Diagram. This user-friendly drawing tool has rich pre-made shapes, which makes drawing rather easy. You can simply drag and drop the shapes, and you can also redesign the shapes because they are vector-based. What's more, it's designed with many automated tools and advanced functions through which you can easily design and customize your drawing. It's definitely the most simple-to-use drawing tool. 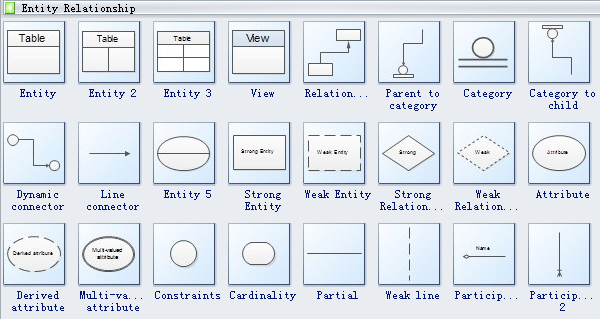 Edraw software includes many entity relationship shapes, entity, view, relationship, parent to category, category, category to child, dynamic connector, line connector, strong entity, strong relationship, weak relationship, attribute, derived attribute, etc. Get started quickly from a database model diagram template which is easy to edit and ready to use. A simple data flow model template is always prepared here to help you save time and energy in your own drawings.